As I child, I never could have imagined that something like Heritage Camps for Adoptive Families existed. The way that the camps came into my life at the age of 27 was pretty unexpected and was clearly meant to be. I was born in Temuco, Chile and I was adopted at 6 weeks old. I grew up in Baltimore, Maryland with my White parents. My mom was also adopted, so adoption was normalized in my family. During graduate school, I undertook a deeply personal exploration of adoption for the first time in my life and connected this to my educational interests. I spent time reflecting on my adoption and how that impacted me as a child/teen, how it continues to effect me as an adult, and how this understanding could inform my professional work. Fast forward 4 years, and I am now a child and teen therapist specializing in adoption through my private practice, Finger to the Moon Counseling. I feel blessed that I get to educate adoptive parents while simultaneously helping their kiddos to heal. 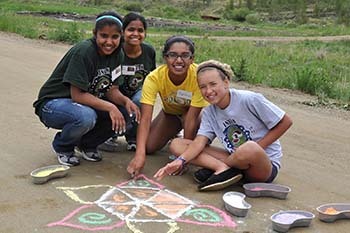 When I moved to Colorado in 2014, I began working with a family who had attended African/Caribbean Heritage Camp for many years. When I heard about HCAF’s focus on connecting adoptees to their culture, and on helping families deepen their understanding of adoption, I immediately knew I needed to be a part of this community. I signed up to go to HCAF’s adult adoptee event, but I was so nervous that I backed out at the last minute! A year had passed when I received a call from a woman who was a counselor coordinator for one of HCAF’s nine camps. She recruited me to be a counselor, and after that initial experience, I chose to immerse myself in the HCAF communities — as a counselor coordinator and as a presenter at four camps. I also joined HCAF’s Advisory Board, where I had an opportunity to play an important role in shaping the programming at camps and the focus of the organization. I also rallied my business team to be a sponsor of HCAF’s annual fundraising event, because I want to ensure that HCAF remains financially accessible to families. My colleagues had a chance to learn more about HCAF’s inspiring work with adoptive families and were proud to support an organization so close to my heart. Witnessing all the adoptive families who have been involved with Heritage Camps for many years brings up a feeling of loss and sadness. As a child, I was raised as a White person; my family did not embrace my Chilean culture. And while I think this was more due to ignorance than malicious intent, I believe I’d feel more connected to my Chilean roots if I had attended Latin American Heritage Camp as a child and as a teen. I know it would have provided my parents with a supportive and informed community and encouraged them to consciously embrace my birth culture. The best piece of advice I could give to parents who are struggling to understand their adoptee is to get really curious about their child’s time in the womb and the time before they were adopted, as this has a more significant impact on their life than we sometimes realize. As a workshop presenter and someone on the adult adoptee panels at camp, I have a chance to share these bits of advice. When I connect with families at camp, my heart lights up because I can feel the love and dedication to their adopted children.